Bolt for .50 Beowulf® that features 0.136 bolt face recess and optimized extractor claw. This is the .22LR Stainless Steel Drop-in Bolt Group needed for the AR-15. Bolt for 6.5 Grendel that features 0.136 bolt face recess and optimized extractor claw. 7.62x39 Enhanced Firing Pin. For use with the MGI® Enhanced 7.62x39 Bolt (EAK-001). When performing maintenance inspections, make sure the tip of the firing pin is neither too blunt (causing possible misfires) or too sharp (possibly piercing the primer). For safety, replace it if you have any doubts. 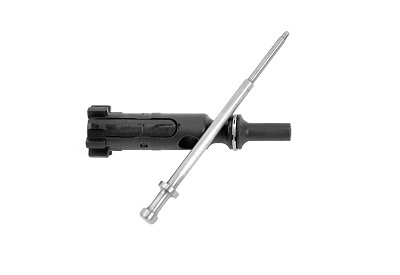 Standard AR-15 Firing pin. Machined from steel to exacting tolerance. When performing maintenance inspections, make sure the tip of the firing pin is neither too blunt (causing possible misfires) or too sharp (possibly piercing the primer). For safety, replace it if you have any doubts. 9mm Bolt Carrier Assembly. This 9mm bolt works both in the MGI® Modular Weapon System, as well as in other weapon systems such as the Rock River 9mm rifles and Colt 9mm Rifles.